Creed toured extensively through its reign atop rock music, but for Scott, the musical machinery to keep the show going meant some terrible personal cost, as he sunk into depths of depression, prompting self-medication that turned to addictive behaviors. His creativity, passion, and desire to be transparent in his struggle never waned, and were evident on his debut solo album, The Great Divide (2005), the Full Circle album from a “rebirthed” Creed in 2009, several tours, his starkly revealing memoir, Sinner’s Creed (2012), and his highly-acclaimed second solo album, Proof of Life, in 2013, which brought Scott’s first number one song on the Christian charts. With the love and support of his family, Scott has continued to live a balanced, healthy and sober lifestyle, grounded in faith. He has a fresh purpose in performing, writing, and singing, to bring hope to “even one person” who is amidst the kind of struggle he knows. Hope has always been a theme of his music, and now, that level of hope takes on a whole new dimension. Scott performed across the country in 2016 ending a successful solo tour with an international tour with his first-ever stops in South Africa this past December. In addition to his thriving solo career, Scott is also the lead singer of the new super group Art of Anarchy who’s first album with Scott “The Madness” is due out March 24th. 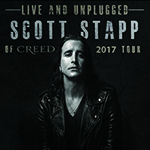 Scott will be celebrating the 20th Anniversary of Creed’s “My Own Prison” with his “Live and Unplugged” tour in May and June of this year.